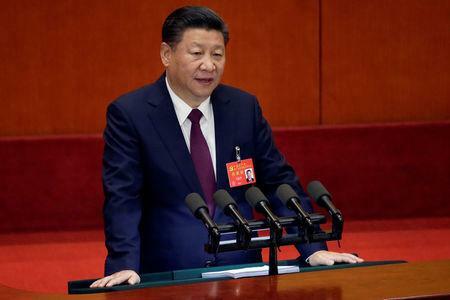 BEIJING (Reuters) - Chinese officials on Thursday heaped praise on President Xi Jinping's political ideology, unveiled a day earlier at a key Communist Party Congress, a sign that it could be enshrined in the party's constitution and further cement his power. Some ruling Communist Party officials were moved on Thursday to song, dance and tears in adulation of Xi, a day after he opened the twice-a-decade conclave pledging to build a prosperous "modern socialist country" for a "new era". Three outgoing members of the elite seven-man Politburo Standing Committee that Xi heads lauded "Xi Jinping Thought on Socialism with Chinese Characteristics for a New Era", according to the official Xinhua News Agency. Such statements indicate that Xi could cement his power with his new eponymous slogan being incorporated into the party's constitution. Whether the theory is included bearing his name will be a key measure of his status, analysts have said. No other leader has had an eponymous ideology included in the document while in office since Mao Zedong, the founder of modern China. Xi is poised to begin a second five-year term next week. Party officials hailed Xi as a wise and great "lingxiu", or leader, a reverent honorific bestowed on only two others: Mao and his short-lived successor Hua Guofeng - another sign that Xi has accumulated more power than his immediate predecessors and could revive a party chairmanship as a precursor to staying on in some capacity beyond the end of his second term in 2022. "Xi Jinping... has obtained the heartfelt love and respect of the entire party, army and people, he deserves to be called wise leader," Beijing party secretary Cai Qi, a Xi ally and one-time colleague, said on Wednesday at a meeting of the city delegation, according to the official Beijing Daily. Officials lavishing praise on the party's top leader at a congress is not unusual, but overt displays of emotion or personal adulation are rare. One female delegate from the southern province of Jiangxi broke into song to praise Xi's treatment of ethnic minorities, while another from Guangdong province said that, listening to Xi's speech, her eyes had brimmed with tears. "I feel that the reason for my country's accomplishments is fundamentally the helmsmanship of Xi Jinping," said Jing Junhai, Beijing's deputy party chief, invoking a phase often used to describe Mao. The 64-year-old Xi has consolidated power swiftly since assuming the party leadership in 2012, locking up rivals for corruption, tightening controls on civil society, revamping the military and asserting China's rising might on the global stage. Some party officials painted Xi as a saviour. 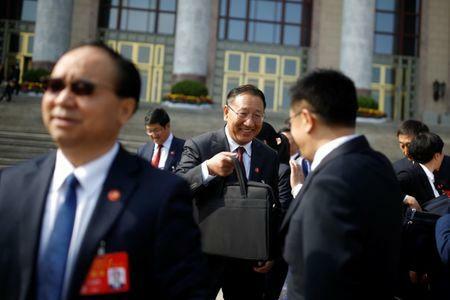 "Because of the Party Central Committee with comrade Xi Jinping as its core, in five years, the party has been saved, the army has been saved, the country has been saved," Liu Shiyu, head of China's securities regulator, said on Thursday. 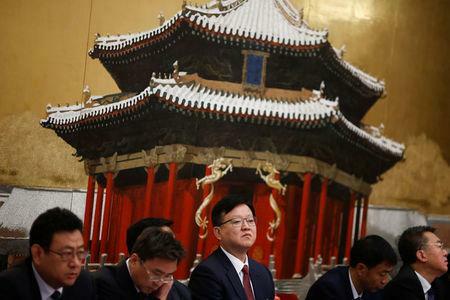 Hu Chunhua, party chief in Guangdong province and a potential contender for a spot on the new Politburo Standing Committee to be revealed next week, simply referred to Xi as general secretary and did not mention his theory during an open session on Thursday, in contrast with more than a dozen other delegates who spoke. State media reported that he had praised Xi's theory the day before. The exact meaning of Xi's new banner term is not yet clear, although it is not unusual for Communist Party leaders to announce lofty slogans and then fill in the details as they go. An ideology named after Xi to guide China and the party would further consolidate his power, said Ryan Manuel, a Chinese politics expert at the University of Hong Kong. "This is a good umbrella for him to just keep saying whatever he wants and the system having to respond and study it," he said. Xi's immediate predecessors, Hu Jintao and Jiang Zemin, have had their ideological concepts enshrined in the constitution, but not their names. The party gave Xi the title of "core" leader a year ago, a strengthening of his position ahead of the congress, adding to speculation that Xi could retain power beyond a customary second term and even revive Mao's chairman title.